Thanks to Dr. Fiona Wilmot! It is with both joy and sadness that we announce Fiona Wilmot is leaving MAP’s Board of Directors. After over 10 years of dedicated service on the Board, she is transitioning to MAP’s Board of Advisors. She joined our Board early on when MAP transitioned from a project of Earth Island Institute back in 2006 to become our own 501 (c) 3 non-profit. 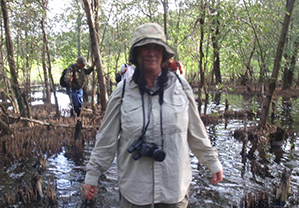 We at MAP would like to thank Fiona for all the hard work and dedication she has given to MAP over those years, especially during more challenging times when she helped to bolster MAP and keep us on track to conserve and restore mangroves. We also note Fiona’s long and dedicated career for the environment, and some of her many other notable achievements. She received her PhD from Texas A&M University in 2014 focusing on political ecology, working with select coastal communities in El Salvador with a view to see how they adapt to environmental, economic and political change. She ran Connectivity, Inc. St. Petersburg, Florida, USA, which provides support services for stakeholder groups engaged in marine conservation and social justice. She has also devoted much time and energy in working for the National Marine Sanctuary Program in the Florida Keys, as well as providing assistance to the Gulf and Caribbean Fisheries Institute. Again we wish to thank Dr. Fiona Wilmot for all she has done and does for our blue planet! We wish her great success in the work she is doing, and look forward to working with her in the years to come, seeking her sage advice and helpful hand in working towards a future for a healthy planet that includes mangroves and mangrove communities!